I’m finding this hard to believe. 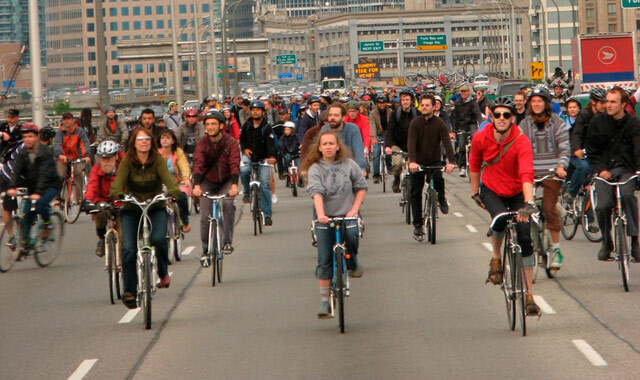 The city of Toronto has announced a multi-million dollar re-building of the Gardiner to accommodate the increasing number of cycling commuters, and ultimately to remove automobiles from the highway during peak hours. Apparently, the Gardiner Expressway between Exhibition Place and the DVP will be open to cyclists only – no motorized vehicles – every day this summer between 7 and 9 am, and again between 3:30 and 6:30 pm. Plans are already underway to construct a retractible plexiglass cover over the same section of the Gardiner to keep commuters warm and dry in the winter. The estimated cost will be $40-50 million. The task force of City Council that made the recommendation was asked if it was really worth spending this much money to keep the cycling lobby happy. The response was that this is not about keeping an interest group happy, it was to improve the quality of life for all Torontonians by cutting down on unnecessary automobile traffic to and from the city during peak hours. “No price tag is too high for that”! This entry was posted on Sunday, April 1st, 2012 at 9:33 pm	and tagged with April Fool, banning automobiles, bicycle commuting, Gardiner expressway and posted in Uncategorized. You can follow any responses to this entry through the RSS 2.0 feed. They’re good with their April Fool’s jokes, I’ll give then that!